The pizza dough I made two nights ago! She has a recipe that calls for just a small handful of basic ingredients that I guarantee you have on hand right now if you cook at all. I decided to give it a go and make a batch of it. (A batch of pizza dough from her recipe makes enough dough for two good-size pizzas). The first night, I did some wacky experimenting and put beans and cheese inside some dough and folder it over like a calzone. This was my attempt of what I was calling "Mexican Calzones". My husband liked it. It reminded him of something like an empanada, but just a different crunchy outside. He said I could make those again and he would definitely eat. This is a HUGE score for me because he is super picky and rarely eats anything I make. In the future, I will try the recipe for calzones in PW's cookbook, and make "Mexican Calzones" for Stephen. The next day I made pizza for Konnor and me. It was another HIT for us both! All in all, this successful pizza crust has made me even more of a true believer that The Pioneer Woman is amazing! Goodbye McDonald's french fries.... I hate you! Their OIL contains wheat?? Say WHAT???? I will admit that I was so upset by this statement! For some reason I found myself crying about it. 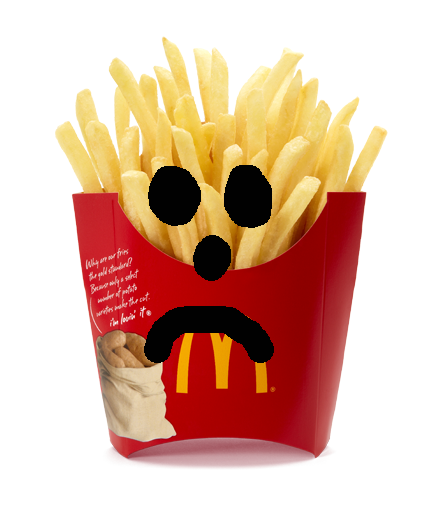 It's not that I love their french fries, but it was an option for me that I used from time-to-time when I took my son for his favorite Chicken Nuggets. 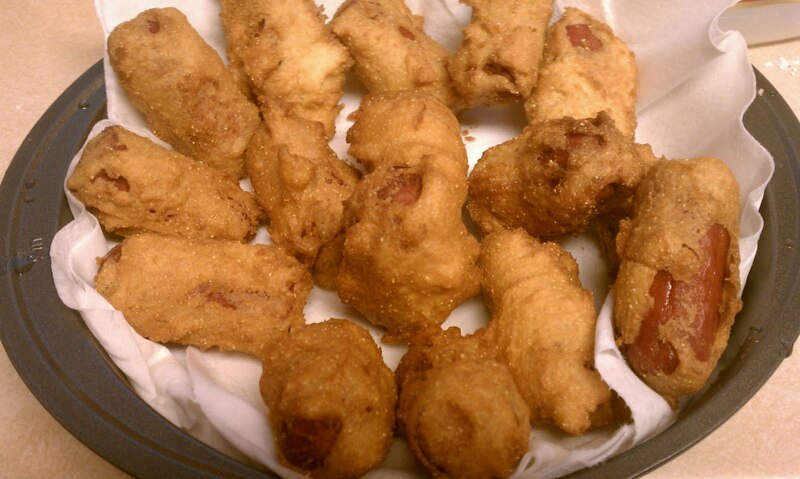 Gluten Free, homemade corn dogs!! 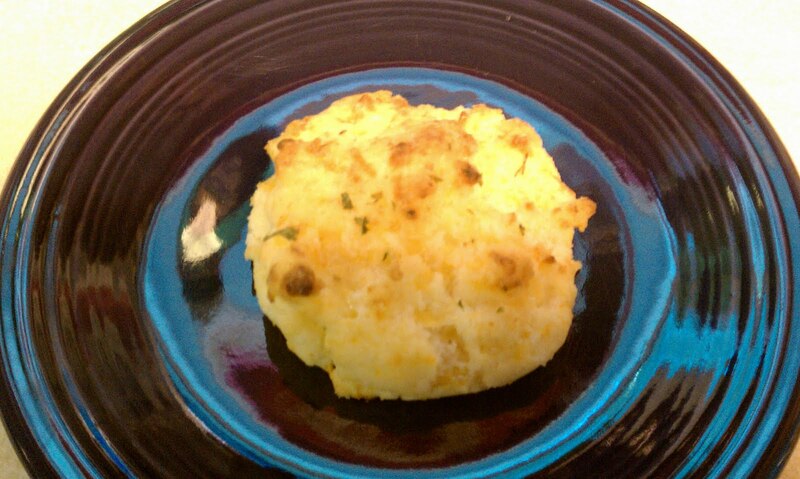 Tonight I made some delicious garlic cheese biscuits like the ones that you can get from that famous seafood restaurant. Delicious!! They turned out so incredibly well. Crunchy on the outside and soft and chewy on the inside. :) Check out the link below for the recipe. I substituted regular Bisquick for my modifined GF bisquick mix as mentioned in the post below. 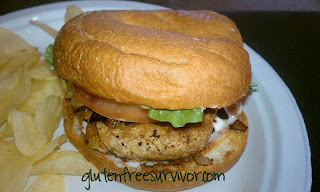 Check out what Adventures of a Gluten Free Mom has to say about the new GF Bisquick. See how she tweaked it a bit adding shortening to the mix. Go check it out! Jennie-O Turkey Burger.... toasted Udi's bagel. Delish!! I call this combo a match made in heaven!! I took a Jennie-O turkey burger and a toasted Udi's bagel and married it with some mayo, grilled onions, a slice of tomato, and some romaine lettuce. I just ordered some GF pita bread from GFL Foods Inc. These pita breads are suppose to be kept frozen until you want to consume one. Then you just pull one out of the freezer and microwave for 45 seconds. This seems easy enough and has received some good reviews, so I figured I would fork out some money and try them for myself. The cost for one package of six pita breads was $9 plus $10.50 shipping. If I end up liking them, I can order up to 4 packages for the same shipping price.